NOTE: This column is available through the New York Times Syndicate. For permission to reprint it, please contact [email protected] or call 800-535-4425. AS RESISTANCE to public-sector unionism has intensified, many of the noisiest confrontations have been on the coasts. In New Jersey, freshman Governor Chris Christie has been locked a battle royale with his state's powerful teachers unions. In California, Oakland's new mayor began her first full day in office by demanding that unionized police officers, who pay nothing toward their pensions, be required to contribute 9 percent of their salaries. In New York, federal prosecutors have opened a criminal investigation into whether Sanitation Department workers purposely paralyzed the city with a work slowdown during last month's blizzard. In Massachusetts, Governor Deval Patrick infuriated public-safety unions by replacing costly police details with civilian flaggers at many construction and repair sites. Now the Midwest is poised to become a major theater in the war against insatiable government unions. Within days of taking office in 2005, two Republican governors -- Mitch Daniels in Indiana and Matt Blunt in Missouri -- issued executive orders rolling back collective-bargaining rights for state workers. Because public-sector unions in those states had been granted the right to bargain collectively through executive orders in the first place, Daniels and Blunt had only to rescind their predecessors' actions. 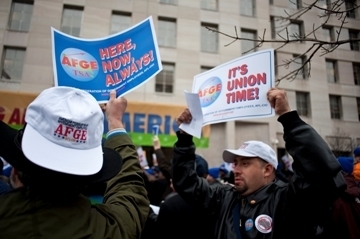 In most states, however, public-employee unions are authorized by statute to negotiate wages, pensions, and health care. Any effort to weaken or repeal those laws is guaranteed to face bitter resistance from the unions and their allies in the legislature. Two newly-elected Republican governors say they're ready for that fight. Even before he was sworn in last week, Wisconsin Governor Scott Walker had fired a shot across the bow of his state's public-sector unions. Speaking to the Milwaukee Press Club, he said he would consider using "every legal means" to weaken those unions -- from decertifying their exclusive right to bargain on behalf of state employees to modifying state law. "You are not going to hear me degrade state and local employees in the public sector," Walker said. "But we can no longer live in a society where the public employees are the haves and the taxpayers who foot the bills are the have-nots." More than 50 years ago, Wisconsin was the first state to enact a public-sector collective-bargaining law, and killing it outright might be too tall an order even for a governor whose party controls both houses of the legislature. But Walker and like-minded lawmakers may well succeed in excluding from collective bargaining the most highly-abused benefit categories, such as pensions and health insurance. In Ohio, meanwhile, incoming Governor John Kasich has long made ending public-sector collective bargaining a priority. In 2009 he said he wanted to "break the back of organized labor in the schools," and last month he underscored his conviction that government workers who go on strike should be fired. Though a pro-labor Democrat, FDR firmly opposed collective-bargaining rights for public-sector labor unions. It was Calvin Coolidge who, as governor of Massachusetts during a police strike in 1919, famously declared: "There is no right to strike against the public safety by anyone, anywhere, any time." Coolidge's assertion made him a rising star in national Republican circles, but opposition to public-sector unionism has an honorable Democratic pedigree as well. 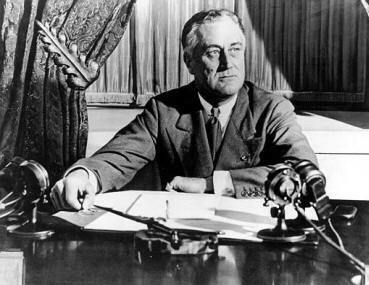 "The process of collective bargaining, as usually understood, cannot be transplanted into the public service," President Franklin D. Roosevelt wrote in 1937. He recognized that government can never be just another employer, and that empowering labor unions to negotiate wages and benefits with public officials would inevitably result in abuse. Today, evidence of that abuse is everywhere. Private employees find themselves working longer and being taxed more heavily so that government employees can enjoy outlandish pay and perks. "Public-sector unions have become the exploiters," Minnesota's outgoing Governor Tim Pawlenty argued last month, "and working families once again need someone to stand up for them." In the heartland as on the coasts, that challenge is being taken up.